Who Do You Think You Are? Magazine is offering the chance to win an expert research guides. More about the Who Do You Think You Are? Magazine competition. The closing date is 13 January 2012. If you're planning a visit to the Hawick Heritage Hub (Scottish Borders Archive and Local History Centre) from 19th December, please note the changed hours. 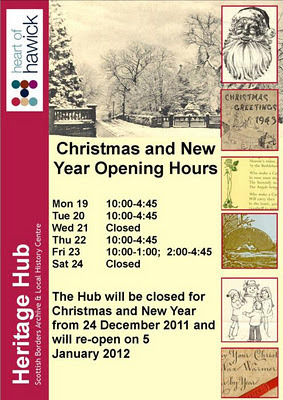 The Hub will be closed for Christmas and New Year from 24 December 2011 and re-open on Thursday 5 January 2012. There's been positive reaction from several people, one of whom said that the new hours are more convenient, another said that she'll make more use of the facilities because she can get in straight after dropping her daughter at school. The letters drawn in the November draw were Z, U, O. The 1st Prize Fund stands at £74.25 and the 2nd Prize fund stands at £19. Yesterday, I added maps for the majority of our parish pages. Castleton, Kirkurd, Langton, Manor, Mertoun, Newlands. One tip - you can't accidentally remove or spoil the map. If the map disappears, or you've resized it or moved it around and you want to look at the original again, just refresh the page. At the Scottish Borders Tourism Industry Conference on 1 December 2011, Martin Ogg mentioned Visit Scotland's intention to geo-web some of their pages. I thought it would be nice to do that for our parish pages but I didn't know how, so I didn't mention it as one of the ideas. After looking at the new additions to digital six-inch maps of Scotland, I noticed that the National Library of Scotland have created a Maps API (application program interface) which makes it possible to put their maps on our website. Ancrum, Abbey St Bathans, Ashkirk, Ayton, Bedrule, Bowden, Broughton, Glenholm & Kilbucho, Bunkle & Preston, Caddonfoot, Cavers, Channelkirk, Chirnside, Cockburnspath, Coldingham, Coldstream, Crailing, Cranshaws, Drumelzier, Duns, Earlston, Eccles, Eckford, Eddleston, Edgerston, Ednam, Edrom, Ettrick, Eyemouth, Fogo, Foulden, Galashiels, Gordon, Greenlaw, Hawick, Hobkirk, Hounam, Hutton, Innerleithen, Jedburgh, Kelso, Kirkhope, Kirkton, Ladykirk, Lauder, Legerwood, Lilliesleaf, Linton, Longformacus, Lyne & Megget, Makerstoun, Maxton, Melrose, Minto, Mordington, Morebattle, Nenthorn, Oxnam, Peebles, Polwarth, Roberton, Roxburgh, Selkirk, Simprim, Skirling, Smailholm, Southdean & Abbotrule, Sprouston, St Boswells, Stitchill, Stobo, Swinton, Teviothead, Traquair, Tweedsmuir, West Linton, Westruther, Whitsome, Wilton, Yarrow, Yetholm. Castleton, Kirkurd, Langton, Manor, Mertoun, Newlands because the API method I'm using doesn't work for these parishes, however I hope to rectify this in the next week. The maps appear below the Magazine Articles listing. The maps used are the Quarter-inch to the mile, Scotland, 1921-1923 and/or the One-inch to the mile, Popular edition, Scotland, 1920-1930. You can use the control at the top left of the map to zoom in or out and drag the map left, right, up, or down as you wish. If you've looked at these pages before, you may need to refresh the page once or twice in order to see the map. Please let me know if you have problems or if you see a mistake. I've just discovered a family member in a new collection indexed by Family Search. They now have 4 sets of vital records for the Isle of Man though there's a warning for the first 3 collections that only a few localities are included and the time period varies by locality. Isle of Man, Parish Registers, 1598-1950, containing baptisms, marriages, and deaths. All in all, there's over 300,000 records included, and that must be good. There's also a full list of all 891 of the Family Search collections. The family member I found was Hamlet Lowe who married Catharine Ware at Braddan, Isle of Man, on 08 Jan 1788, though, of course, I still need to check that he is the correct one. I wonder where she was born, as there's no mention of her birth in the Isle of Man. To commemorate the 70th anniversary of the defence against the attack on Pearl Harbor, Hawaii; Ancestry are offering their entire collection of 58 million World War II military records for free access until midnight ET on 7th December (which I think means 5am GMT on 8th December). You can search and get a skeleton overview for nothing, but to get the details you'll need to register for (or sign in with) a free account. It doesn't say so, however their records seem only to relate to people that lived in America or who were in the United States forces. This does include Scots born here, so it may still be worth while searching. There's an illustrated PDF research guide available for download. I went to the Scottish Borders Tourism Industry Conference today, organised by Visit Scotland and Scottish Borders Tourism Partnership held at the Buccleuch Arms Hotel, St Boswells. There were about 50 delegates. I didn't know what to expect and I thought it wasn't likely to be useful particularly as I had intended going to the monthly Scottish Borders Social Enterprise Chamber Business Group meeting. I'm glad I attended, and fortunately the Salmon Room at the hotel was warm on arrival. I was very inspired by Professor John Lennon's talk on 'Tourism businesses and how to survive in a recession'. Although Borders Family History Society is a charity and not a tourism business that needs to make a profit, much of what Professor Lennon said was valid for us, too. It's also important that as a charity we generate a surplus to help us remain sustainable and improve facilities for our beneficiaries. We're also members of Ancestral Scotland and we think it's so important that we have the Ancestral Scotland logo on our home page. I got some good ideas from Martin Ogg's presentation on the new Visit Scotland website and the work that the website team are undertaking. I didn't understand a lot of the Marketing presentation but there were some stunning images in their new campaign, and as a regular user and reviewer for Trip Advisor , I was interested that there was a widget available (though it costs £200) for tourism businesses. Nice buffet lunch especially the tomato soup. I also attended the Accessible Tourism session after the main conference, telling the fewer people that remained about the importance of accessibility and how to improve. I think this session should have been in the main conference. We were told the slides for the presentations will be on the Visit Scotland corporate site, and I found them useful.